Senate Majority Leader Mitch McConnell announced Tuesday evening he filed cloture on Judge Neil Gorsuch's nomination to the Supreme Court. The U.S. Senate is one step closer to going nuclear — legislatively, of course. 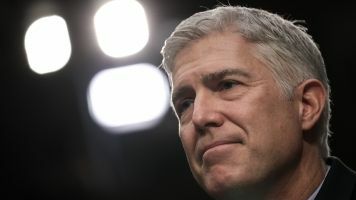 Senate Majority Leader Mitch McConnell announced Tuesday evening he filed cloture on the nomination of Judge Neil Gorsuch to the Supreme Court. Senate Democrats planned to filibuster the nomination. By filing cloture, McConnell is looking to stop the filibuster and bring Gorsuch's nomination to a vote. Based on cloture procedures, the Senate will vote on the cloture motion one hour after it convenes Thursday. Sixty senators would need to support the motion in order to limit the debate to 30 more hours. But McConnell likely doesn't have those votes. That's where the so-called "nuclear option" comes in. McConnell and his fellow Republicans can break with Senate precedent and require only a simple majority — 51 votes — rather than 60 votes. In 2013, Senate Democrats imposed the nuclear option on filibusters for most other presidential nominations. If all goes as expected, the Senate will likely vote on Gorsuch's nomination Friday.